Late last year, I prepared a review essay regarding Edward Burtynksy and Jennifer Baichwal’s film Watermark for Harvard Design Magazine‘s 39th issue “Wet Matter.” Unfortunately, the HDM could only publish and abbreviated version because the issue was packed with a great variety of other fascinating material, all presented in a truly lovely package. Thanks to Pierre Bélanger, Jennifer Sigler and Leah Whitman-Salkin (all of the Harvard Graduate School of Design) who edited the issue. This piece builds on some of the themes I was working on in my chapter for a wonderful collection of essays titled Thinking With Water, edited by Cecilia Chen, Janine MacLeod and Astrida Neimanis,which came out in 2013 from McGill-Queens University Press. Edward Burtynksy and Jennifer Baichwal’s majestic and meditative 2014 film Watermark, an exploration of, in Burtynksy’s words, “how water shapes us, and how we shape water,” opens with an image of ethereal abundance. Liquid volume throbs across the screen; mist, particulate, vapor entangle and detangle, a mesmerizing vortex of hydrodynamic force. 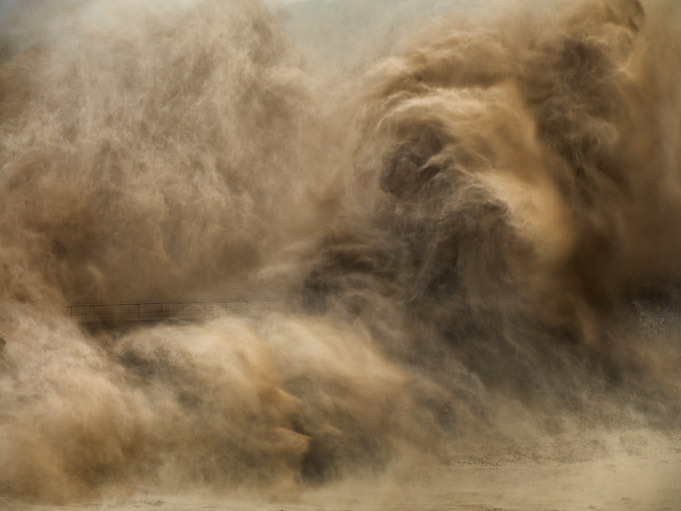 Before it is revealed that this is the annual blowing out of 30 million tons of silt accumulated behind China’s second largest dam, the Xiaolangdi on the Yellow River, we are, for a moment witness to something both terrifyingly sublime and unsettlingly intimate. The existentially familiar flow of water, so often cited (indeed, marketed) as a source of relaxation and harmony, here is frenzied, alien, preternatural. 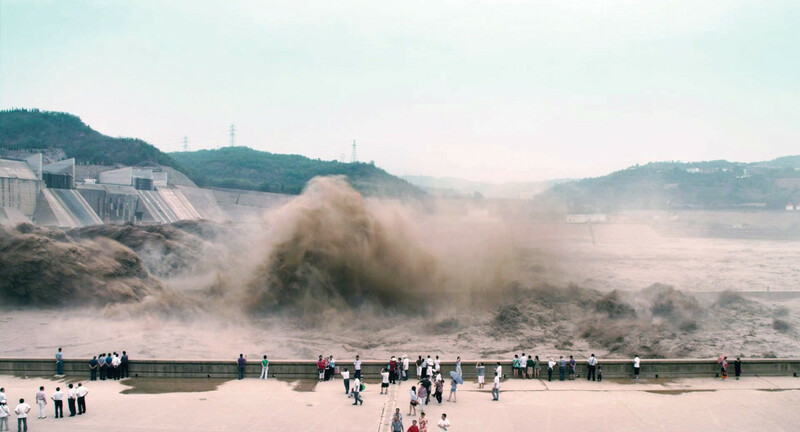 The dam is not only a generator of energy, it is a materialization of power. 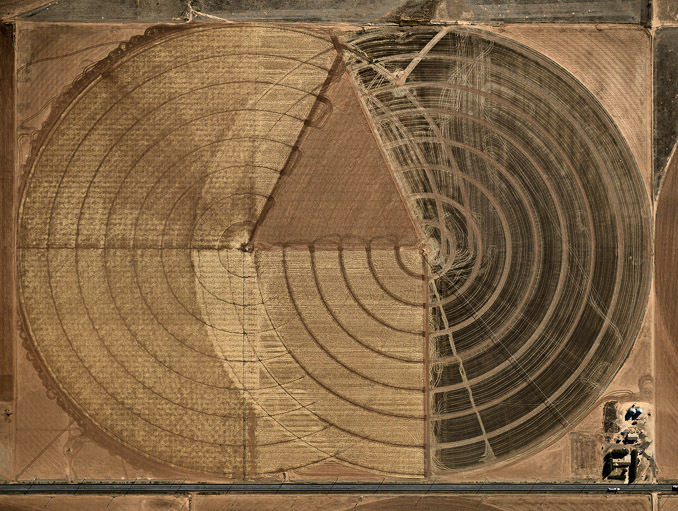 Consider the incredible global array of forces–material, immaterial, human, non-human—that combine to create today’s megadams: copious engineering expertise, advanced concrete casting, political will, the forced removal of villages in the floodplain (200,000 souls in the case of the Xiaolangdi Dam, with an estimated resettlement cost of $1 billion US), millions of hours of human labor… The Xiaolangdi dam cost an estimated $3.5 billion US, was financed in part by the World Bank, and depended on a phenomenal international collaboration of firms and subcontractors. The dam, writ large, is a manifestation to the control of the flows of human cooperative activity, a grand tribute to the power of the coordinated imagination. Yes, the dam generates power, but it is also generated by power, in this case primarily by the Chinese state, eager (as were the Americans, a century ago as the Hoover Dam took shape) to prove their national project by subjugating the river mighty dragon said to dwell in these stories waters. Yet the dam is a sacrificial altar to some new dragon, some new remorseless, supernatural force. As social anthropologist Veronica Strang vividly illustrates, the politics of water and hydraulic infrastructure are not only pressing global and local issues, but strike precisely at the faultline of the economic value and cultural meaning, at the artificial but fraught seem between “culture” and “nature.” Struggles over globalization’s futures, local resilience, ecological sustainability and modern development are preoccupied with how water will be managed, and by whom. These insights resonate with the approach of Actor-Network Theory, which encourages us to consider the agency of non-human actors, like watersheds, like rivers, like dams. What are the dam’s desires, its drives, its passions? How is the dam both created by and the creator of other actors (human and non-human)? Attending to the way the dam itself dreams can reveal the role of dams in our dreams. But equally we would need to draw on the work of Marxist critics like Fredric Jameson, who insist that we attend to the “political unconscious” of society, the way that the sublime totality of material relations of production, exploitation, inequality and profit find their fragmentary expression in cultural texts, images, themes and narratives. Here, the dam stands as not merely an economic, political and sociological entity, but a cultural symbol or cypher, some archetype stationed, ominously, amidst the unfathomably complex flows of global imagination. In its capacity to transform power (hydraulic to kinetic to electric to economic to political to imaginative) the dam is a hub of meaning, identity, ideology and intentions. The dam is a concretization of global flows (financial, human, cultural, material) and as such both reflects and reproduces the overarching power paradigm. If the dam is an altar of sacrifice, is it any wonder that in the image of churning mist that opens Burtynksy and Baichwal’s film we see ghosts? No, not only the ghosts of the villagers displaced by the dam, not only the ghosts of the workers who died building it, not even the ghosts of the innumerable non-human life-forms (mammals, fish, sea flora) whose lives, migratory patterns, spawning cycles, hunting waters or food sources have been disrupted. No, here is a living, cinematic Rorschach blot, not merely a meaningless image, but an image generative of meaning, of shared meaning. It is as if, in this hypnotic flow, we can witness our own imaginations at work. And the imagination, contrary to common belief, is not only an individual mental terrain – it is a shared ecosystem shaped by and shaping our actions and interactions, shaped by and shaping power. Hence in Burtynsky and Baichwal’s opening image of the Xiaolangdi silt release comes to us like a confession, our own confession. We are all the products (and, in our way, the producers) of the world of the megadam. No single institution is so iconic of the modernist project on which our societies and our identities are built. Globally, 16% of electricity is derived from dams. Dams restructured the global economic system, with many post-colonial nations undertaking dam-building projects as a means to modernize and build economic capacity (and succumbing to incredible, often odious debt to do so). China’s current enthusiasm for building ever larger, ever more sophisticated dams speaks not only to the emerging superpower’s need for electricity, but also the way that the dam is the key protagonist in narratives of national process, patriotic spirit, cultural sophistication and state and economic authority. The legendary emperor and moral exemplar Da Yu (c. 2200 bce) is fabled to have been bequeathed his throne as thanks for his orchestration of dams and other waterworks that prevented floods and rendered the Han heartland available for civilization and development. How fitting, then, that the Xiaolangdi dam is the source of this awesome spectacle, a spectacle advertised to and attended by tens of thousands of tourists, drawn by the aesthetic beauty and uncanny charm as a concoction of silt and water erupt from the heart of the dam, the two elements swirling and dancing in the air as if possessed by the spirit of the dragon. The dam, yes: this global icon or monument to our ability to harness the power of the elements, to intercede in nature’s rhythms, to interrupt and tap the eternal cycle of mountain to river to sea to cloud to mountain, to tame fate and prevent floods and irrigate otherwise infertile lands. And so we can speak of the dam not in terms of particular instances, but as something of an archetype, a shared ideal with local instantiations. Certainly there are some dams that are better constructed, more ecologically sustainable, and have fewer human costs. Yet dams, by and large, are the products and, in many ways, the reproducers of an incredibly violent global system of increasingly deregulated and renegade neoliberal capitalism. In spite of claims that they will lead to universal social uplift and progress, dams, more often than not, empower the already powerful and disempower the already powerless. Dams create and define an upstream and a downstream. They interrupt and draw power from the cycles of ocean and atmosphere. They crystallize the flows of power. Typically, they create flooding upstream in the name of protecting and energizing downstream. It’s no coincidence that, by and large, they sacrifice more traditional, often indigenous villages and peoples upstream in order to empower the downstream coastal cities which were founded or gained their prominence in the age of mercantilist and capitalist globalization. The dam hold back not only rainwater and silt, it also hold and channels time itself, replacing the river’s rhythms with the syncopations of progress, growth and development. Touted as a source of renewable, clean energy, it is worth asking: what power do they renew, and what histories and spaces do they cleanse? For Booker-prize winning Indian novelist and essayist and well-known anti-dam activist Arundhati Roy, the mega-dam is a global symbol that represents the triumph of technocracy over democracy, of profit over people, of technical expertise over indigenous knowledge, of the the state over society, of capital over community. 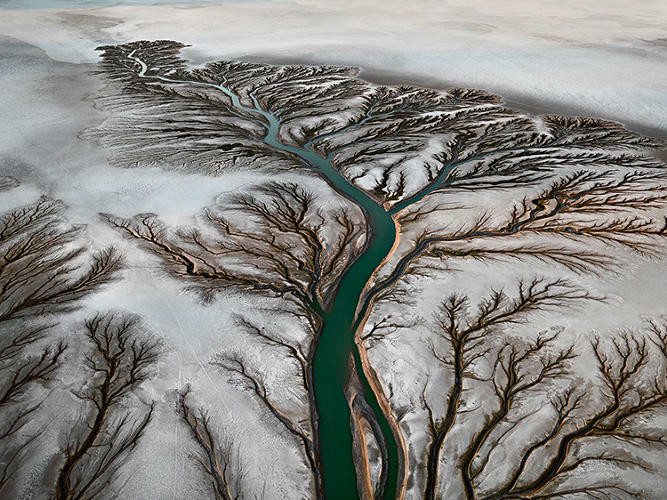 Hence the incredible aesthetic power of Burtynsky and Baichwal’s moving images of the Xiaolangdi Dam’s silt release. Silt: particles so fine (less that 0.01mm) they are carried in the river’s flow, are only visible to the human eye in their accumulation. Like the million microviolences of the dam, they only come into perspective when they congregate. 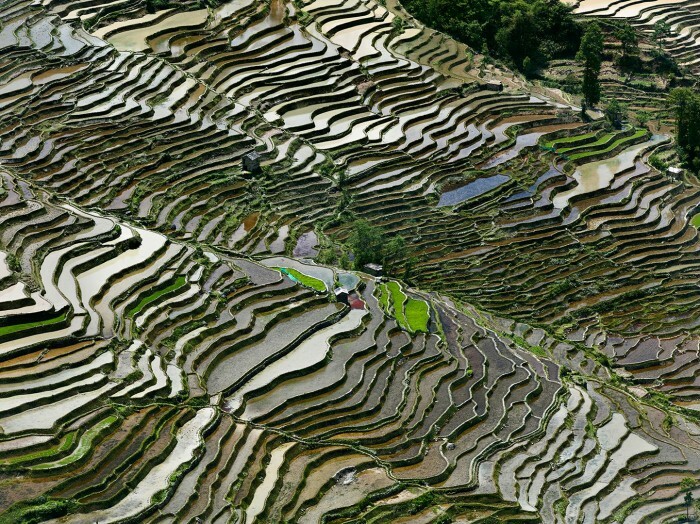 Like silt, the stories of displaced villagers, of ancient indigenous agrarian practices, of drowned forests, of the disrupted migratory patterns of birds and fish and other animals, of the intensification of agriculture and its attendant standardization of labour appear, in isolation to be regrettable but insignificant. Like silt, thought, they, when taken together, when aggregated globally, constitute a haunted mass, the mysterious “dark matter” that holds our world together. Indeed, the accumulation of upstream silt has, historically, been a leading cause of dam failure. The sedimentation of particulate matter in the beds of dam reservoirs typically reduces their flow and capacity by between 0.2-2.3 percent per year. The Lilliputian assault of silt on dam turbine blades also takes its toll. Hence the cunning engineering development of modern dams like the Xiaolangdi, which annually blasts out the accumulated silt in a charismatic spectacle of release. One is reminded of the Roman Saturnalia, the Carnival, and other similar annual festivals the world over where, for a limited period of time, the “world is turned upside down,” the dams are opened, the rich become poor, the poor rich, and those dark, anarchic drives are let loose. All, it must be said, so that on waking the next day, we might find the social order might be restored, stronger and more resilient thanks to this spectacle fo release. We are drawn to this aqueous mirage because in it we sense a letting go, an uncorking, a release of pent up contradictions. Watermark’s minimalist narrative is composed of a suite of vignettes, scenes where water and humanity meet, swirl, eddy, interact, erode: An Indigenous Mexican woman whose lands in the Colorado river delta have been parched by the redirection of the watertable to upstream irrigation in Texas; the pilgrimage of Hindu worshipers to the Ganges; a leather tannery in Dakha where millions of litres of water are used and laced with toxic chemicals to create luxury leather products for Western markets; a team of scientists in Greenland extracting cores of ice to contrast today’s rapid, catastrophic global warming to those more natural processes in past epochs. 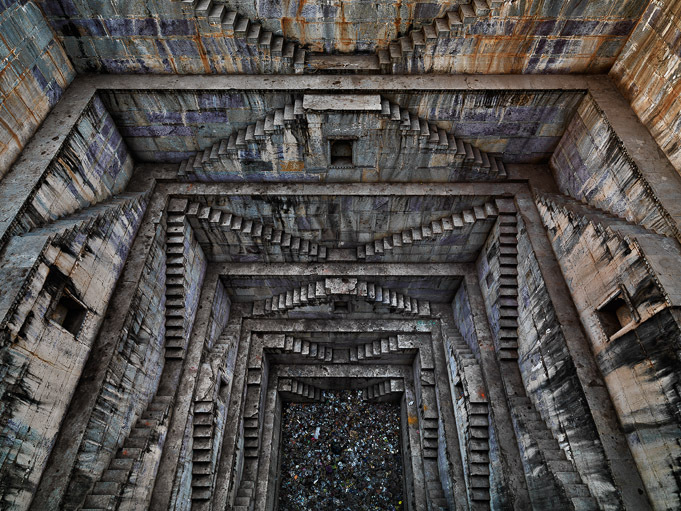 The only scene we return to with any regularity are the breathtaking panoramas of the construction of the Xiluodu dam in China’s Yunan province. We witness the vertiginous scale of the construction; we are introduced to the workers and their labour camp; we see the odd combination of modern construction equipment and techniques as well as pastoral women, somewhere in the concrete world, sweeping debris with reed brooms and carrying gear on their backs in woven baskets. That we and the filmmakers’ return to the dam, time and again, is fitting, for the dam in some ways emblematizes and dramatizes the key tension at the heart of the film’s power: in an age when we seem capable of amazing feats, when we can, with precision and acuity, command the most elemental substance of all (water), we are, somehow, more than ever at the mercy of seemingly uncontrollable flows. In an era when we have empowered ourselves to tame the rivers, we are ever more susceptible to the tides, which rise and rise thanks in large part to human-led climate change. Even as we use the world’s resources and power to make more and more material wealth, inequality and existential poverty appear to swell and overflow. Even as the world’s mightiest river dragons are tamed, harnessed and humbled, we find ourselves carried in some deeper, more monstrously sublime current downstream to who knows where. Amidst it all, tensions accumulate like silt. In the construction of the dam we at once witness the triumph of the designer’s ethos, the incredible power of human collaboration and innovation, threaded through the eye of a needle, honed to a cutting edge. The dam is magnificent, awesome – a monument to our collective power. Yet so too is it all to easy to lose sight of the grander insidious designs at work, those injustices, disruptions, horrors, blockages, violences that, only when taken together, over the last century of the dam, become intelligible. Easy enough to excuse these each as isolated tragedies or inevitable misfortunes; easy enough to rationalize it as contingent, accidental, incidental – not by design. Yet might we not imagine yet a larger design at work? Many nations who build dams are far from the idealized archetype of free market capitalism. And most nations that build dams do so as government-funded or backed projects. Yet still, the designs of capital cannot be washed away. The dam is the key to a form of modern socioeconomic development that is beholden to and led by the maelstrom of global markets, the increasingly unimpeded and unrelenting flows of currency. China – ostensibly still a Communist country – dams its legendary rivers in order to empower their rapidly growing, export-oriented and consumer-driven economy. Those peasants and villagers displaced by theses dams, by and large, soon find themselves in the growing cities of the nation, workers in special economic zones producing the world’s consumer electronics or other materials. Elsewhere, in much of the third world, dams were built at the behest of the International Monetary Fund and World Bank, or other neoimperialist international financial institutions in order to provide electricity to primary industries, or to regulate water levels and provide irrigation to export-oriented cash crops, or simply to create a lucrative market for Western materials and expertise, the costs of which haunt current and future generations in the form of debt. In any case, dams also create flows of people, largely from the upstream villages to the downstream cities where, like silt, they settle, uneasily, in slums, barrios, favelas. The broader design here is not any secret conspiracy or ideological master plan, although it is animated and accompanied by the fundamentalist belief that free markets, low taxes, trade liberalization and corporate globalization. It is the result of the inhumanly complex hydrodynamics of capitalism, of international competition, of the profit motive, of dreams of wealth and fears of poverty. It is the vanity of nations, the cupidity of bureaucrats, the powerlessness of peasants, the hunger of entrepreneurs, the corruption of cynical officials, the apathy of the middle classes, the narrowness of engineers, the venality of politicians, the desperation of workers. In this sense, the dam designs us, organizes the flows of human and non-human energies into durable, reproducible patterns. 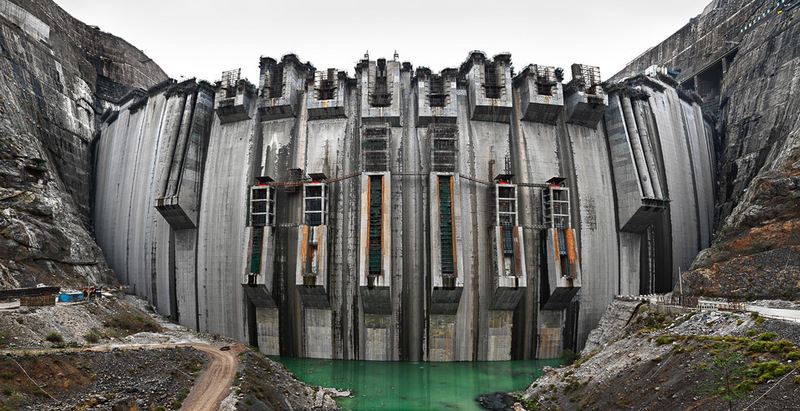 True: dams like the Xiaolangdi or the Xiluodu are remarkable feats of engineering and design, and a magnificent tributes to the power of the human imagination as a collective force for transforming the material world. But it also represents a tremendous failure of the imagination and of human cooperation, the horrific result of the compartmentalization of labour and cognition which cannot take in the plurality and complexity of flows, cannot fathom both the upstream and the downstream together. 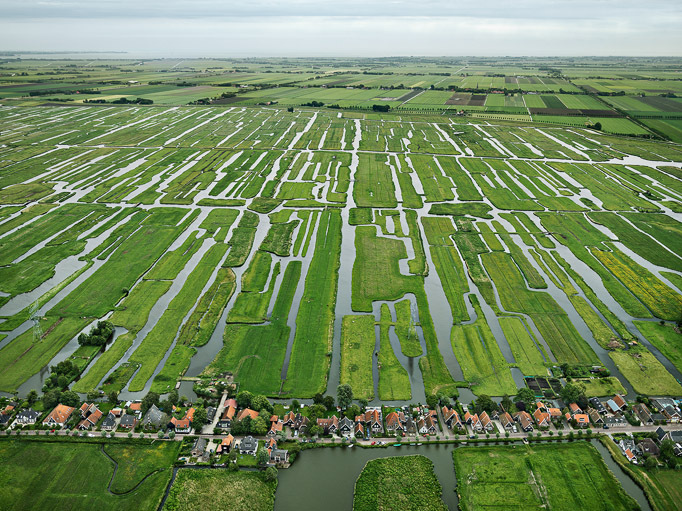 Burtynsky and Baichwal’s Watermark represents, in its very form, a critique of this paradigm. Unlike others in its genre, it does not strive to impress us with a single linear narrative, though, like an undammed river, it has an undeniable and compelling trajectory. We travel between points, locations, scenes, images and interviews as if on a riverboat, slowly, episodically, yet with a definite sense of rhythm and purpose. There is a slow grace here, one neither engineered to nor insistent on travelling a straight line, and as if we are snaking our way along the river dragon’s back, some scenes recur, now from a new angle. There is a patience here, a trusting in the river’s own non-human (more than human) efficiencies. A wealth of meaning evaporates, precipitates, collects, flows and merges again with the sea. Those eager to see a more activist stance might wish the film more heavy-handed in its condemnations of the hydropolitics of contemporary globalization. Certainly there is a patent need for stark revelations and militant refusal. But one of the documentary’s key strengths is to model for us a different way of thinking and of feeling, one that stands in stark contrast to the model both emblematize and reproduced by the dam itself, one possessed by the spirit of the silted and muddy river.